Come and join us on the 18th of August for this year's open day. There will be live music and food cooked over an open fire plus all your favourite Triple fff ales from this year. The brewery will have it's doors open for the public to come in and have a look around your local brewery. There is also our newly refurbished shop onsite to buy beers, wines and spirits from around the world as well as fresh poured beer to take away beer from Triple fff. Our new bar will be open all day. Starting from 10 am, food served when it's ready and plenty of beer. Be prepared and bring a camping chair and any soft drinks you may require. Ratebeer.com is a very popular website for beer drinkers and enthusiasts to use in choosing, tasting and reviewing beers from the worlds brewerys and it was anounced on the 31st January 2017 that Citra Sonic has been voted Hampshires Best Beer! We are obviously thrilled with this news and want to thank everyone who took the time to vote and review Citra Sonic after drinking it. We are brewing the next batch in March and it will be available from April through to Sept/ Oct this year. 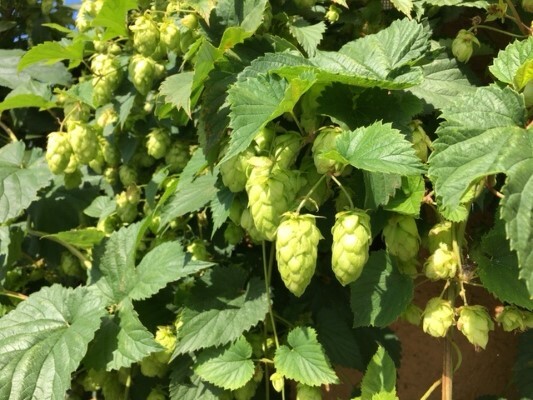 Following on from the successes of previous years, we are asking the local residents of Hampshire and Surrey to contribute freshly picked hops to this years brew on the 6th September. We brew this beer to celebrate the hop picking season and also to remember the many hop gardens in the region from years gone by, that supplied the breweries of Alton. Beers are normally brewed using dried hops but we have the chance to brew with the fresh cones only once a year which impart a very different and unique flavour and aroma. Fresh hops can be found in gardens and hedgerows through the two counties. In previous years, you have managed to collect between 12-16kg of fresh hops for our brew of Smells Like TEAM Spirit, a 4.8% abv English ale and we would love to beat that figure this year. All donations should come up to the brewery within 48hrs of being picked due to the delicate nature of the hop cones and contributors will be able to sample the beer when it's ready later in September by taking away 4 pints to share with family and friends..sharing is optional! Your local brewery needs YOU! Come and join us on the 20th of August for this year's open day (weather permitting!). 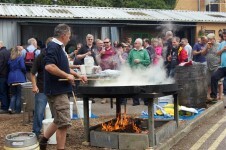 There will be live music and food cooked over a huge open fire plus all your favourite Triple fff ales from this year. The brewery will have it's doors open for the public to come in and have a look around your local brewery. There is also our newly refurbished shop onsite to buy beers, wines and spirits from around the world as well as fresh poured beer to take away beer from Triple fff. Starting from 12 noon, food served when it's ready and plenty of beer. Be prepared and bring a camping chair and any soft drinks you may require. Following the refurbishment of our brewery shop, we will be having a tasting night on the evening of the 21st July 2016. You are invited along to samples some of our beers, wines and spirits from around the World and chat with us about the different styles and flavours we now have on offer. Also on the night you will be able to enjoy 20% on all bottled beer and wine purchased on the night along with 10% discount on spirits. The evening will commence at 5pm and finish around 8.30pm. Contact us on 01420 561422 if you have any questions. 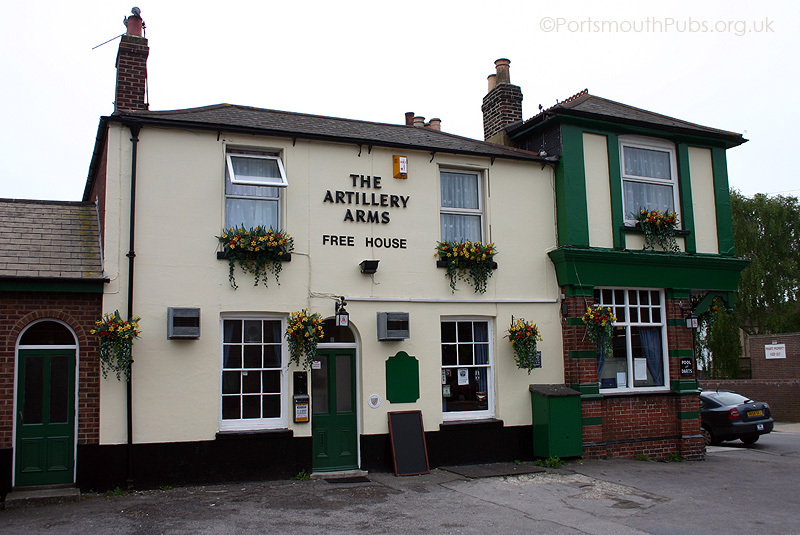 From the 27th March 2015, The Artillery Arms in Hester Road, Milton, Hampshire, PO4 8HB, will join the fold alongside The Railway Arms and the White Lion to become the third Triple fff Brewery pub. The pub holds a good range of beer and is a short walk to Portsmouth Football Club, so gets very busy on match days. It is a very traditional pub wih a large garden for the Summer months.